The entrance to Stravanan Road, Castlemilk. A MANHUNT IS underway in the UK after a car drove into a group of young teenagers in Glasgow, according to UK reports. 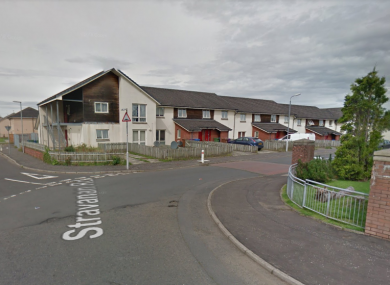 Scottish police said that at around 3.30pm yesterday, a silver Vauxhall Astra drove into five teenagers who were gathered on the pavement on the Stravanan Road, Castlemilk. The car, which was driven by a man, failed to stop and made off in the direction of Birgidale Road. A 14-year-old girl was taken to hospital where her condition is described as serious but stable. Two girls aged 12 and 14, and two boys aged 12 and 13, were treated for minor injuries at the scene or in hospital. Detective Inspector Peter Sharp of Cathcart Police Office said that they believed the car was driven “deliberately” at the children and are treating the incident at attempted murder. Extensive police inquiries are continuing to trace the man driving the car, his male passenger and also the vehicle involved. Officers are following a number of lines of enquiry. “At this time I would appeal to any witnesses to this incident, or anyone with information that may assist this investigation, including anyone who may have details of the silver Vauxhall Astra involved to contact police as a matter of urgency. Anyone with information on the incident is asked to contact Cathcart Police Office on 101 quoting reference number 2777 of 24 March, or Crimestoppers anonymously on 0800 555 111. Email “Car 'deliberately' driven into group of teenagers in Glasgow - police”. Feedback on “Car 'deliberately' driven into group of teenagers in Glasgow - police”.